Happy Friday, Noshers! Any weekend plans? Last minute shopping perhaps? 🙂 Check out my Holiday Gift Guide for inspiration! Today’s fun fact is sooooo mouthwateringly delicious, I had to double-check to make sure it was real! Some Chocolate Covered Strawberries, perhaps? 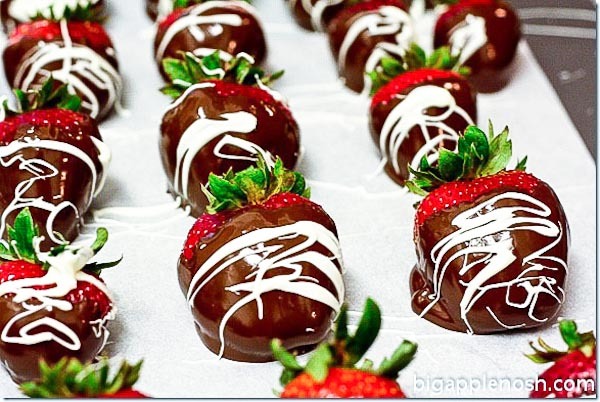 Today is National Chocolate-Covered Anything Day! chocolate-covered anything?? that sounds like my kind of day. Good thing today is potluck at work! SO MUCH CHOCOLATE! Yum, your fun facts keep getting more delicious!!! Lucen muy hermosas,gran receta de navidad,abrazos hugs,hugs. Oh my goodness that picture is amazing!! xoxo I think I might treat myself today! Happy Weekend!